Most of us, at one point or another, read to escape. Sometimes it’s from something serious, other times it’s just a minor annoyance; regardless, books create a perfect little bubble to hide from the world. The mark of a truly great book is one that doesn’t only shelter you from your troubles, but actually brightens your spirits throughout. Emma is the perfect example. I had an awful, awful weekend, which I won’t bother going into, just suffice it so say I pretty much just wanted to curl up into a ball and die. 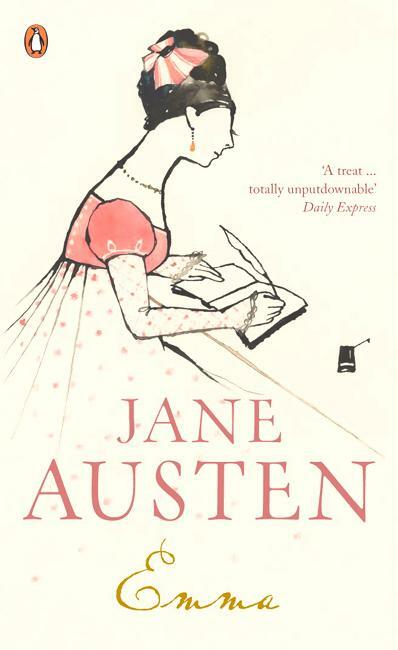 But Jane Austen creates such a perfect world in Emma, with loveable if slightly flawed characters, that you can’t help but feel slightly cheered by the end. Quick-witted, beautiful, headstrong and rich, Emma Woodhouse is inordinately fond of match-making select inhabitants of the village of Highbury, yet aloof and oblivious as to the question of whom she herself might marry. This paradox multiplies the intrigues and sparkling ironies of Jane Austen’s masterpiece, her comedy of a sentimental education through which Emma discovers a capacity for love and marriage. Although I appreciate we have had a rather turbulent relationship, I am now ready to reestablish our closeness. It pains me that we lost touch, but after reading the disappointing Sense and Sensibility and Mansfield Park right after Pride and Prejudice (which I adored), I erroneously convinced myself that you were a one-trick pony and that the remainder of your books just weren’t worth reading. For that, I apologise. I now realise I was deceived. I have owned every single one of your books for a good while, but earlier in the year I finally started Persuasion. In all honesty (because we’re such good friends I feel we can be candid), I only picked it up because it was short. Despite my dubious reasoning, I loved it almost as Pride and Prejudice. Unfortunately, it only led to further confusion about your writing ability that I vowed to resolve. So, timidly albeit, I picked up Emma, and it is this book that has prompted me to reevaluate our relationship. I know that it’s one of your most criticised novels, but I actually liked Emma. The character, I mean. She’s a bit silly sometimes, but she always means well and accepts when she’s been accidentally rude. I heard that you wrote her character in response to critics claiming that Fanny from Mansfield Park was too much of a prude. I fully agree with your judgement – Emma is much more interesting than Fanny. I particularly enjoyed the ending to Emma – it enabled me to pretend my own troubles didn’t exist. You wouldn’t understand, as it involves alcohol and psychotic ex-girlfriends, but I appreciate the help all the same. I haven’t read a book in a long time that I felt so connected to. So this short note serves to declare my undying love for you (in a non-Sapphic way, as I’m sure your family wouldn’t approve) and to apologise for any offence I may have given you. Cause, you know, you’re fully able to be insulted by a 22 year old who was born 172 years after you died. Love the letter. I also love Emma as well. Great review! So glad you liked Emma. Maybe you should give the others another go? I love Sense and Sensibility and even enjoy Mansfield Park, though it is my least fave Austen. Northanger Abbey is also fun. I prefer it and S&S to Emma, though it doesn't help that I had to study Emma at school so that kinda sucked the fun out of it. P&P is of course my fave, followed closely by Persuasion. Those two are my go-to happy books. @Belle – Yeah, I was thinking I might go back to Sense and Sensibility because I can barely remember it apart from a sprained ankle maybe? To be fair, I was about 14 when I read it so maybe my opinion will have changed. Ha, we never studied anything that interesting at school. Just four pages of Jane Eyre as far as I can remember. @Hannah – that was just it, I wanted to talk about it because I loved it so much but it's not really reviewable (yes, that is a word. Maybe.). Plus, I genuinely feel kind of bad for judging Jane Austen!